A coastal and homey 2 bedrooms, 2.5 bathrooms villa in Ocean Breeze near Coligny in Forest Beach! 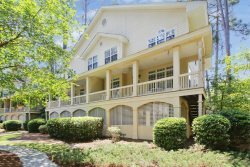 Just a couple of blocks away from the pleasures of Hilton Head's popular “downtown area”, tucked away on LeMoyne Avenue, is this coastal and homey 2 bedrooms, 2.5 bathrooms, Non-Smoking villa in Ocean Breeze. With plenteous bike trails and over 100 shops and restaurants within walking distance, the activities for your home away from home vacation will be limitless. This 2-story townhouse style villa features a creative 'Z' design floorplan with a spacious first floor open from the front door to the private rear deck. The cheerful foyer with its hardwood floor will take you pass the dining room, graced with a black- finished dining table and four comfy chairs, over the plush area rug located under the table and into the open, galley-styled kitchen. Laced with all stainless steel appliances, including a convection oven, you will have all the essential items that you need to make quick and easy meals or gourmet delicacies. Three bar stools sit at the breakfast bar and separates the kitchen from the living room. The living room is decorated in browns and tans with a few, lite touches of blue and houses a queen size sofa, a loveseat, a comfy armchair, a mounted flat screen television with a Blu-ray DVD, and a sliding glass door that leads to the back deck. The stairs on the back deck leads directly to one of the community pools. The villa is stocked with both adult and children DVDs along with board games and cards. Free high speed internet and WIFI is included with unlimited local and long distance calling and cable for your convenience. Upstairs you will find a king-size bed in the master bedroom with regal, coastal décor and beautiful double hung windows that overlook the lush landscape. On the way to the guest bedroom, you pass a washer and dryer closet, as well as, a lending library stocked with a wide variety of books. The guest bedroom is perfect for kids and young adults with a queen-size and a twin-size bed delightfully decorated with greens and blues. Both bedrooms have private bathrooms with shower/bath combinations and are equipped with a flat-screen television with cable and DVD player. The villa also offers four beach chairs, sand toys, cooler and a beach wagon for your convenience. Additionally, for families with little ones, one set of bed rails, a chair booster seat, step stool for the bathroom and kid-sized plastic ware are provided. The Ocean Breeze complex is pet friendly, has three swimming pools that is open from April through October, with one in this villa's back yard, free on-site tennis, and is only a short walk to the beach. Both Coligny Circle and Alders Lane beach access points offer restrooms, showers and a life guard station during peak season and are less than a 10 minute walk from the villa. All beach distances are measured from the center of the complex. 2 car passes are allowed per villa. Your team is excellent and efficient. Love the villa it just needs a good cleaning. They were very helpful in providing me several options for my stay. Great week. Appreciated the detailed check in email. Very nice. My daughter forgot one of her favorite rings when we left and they were very helpful in retrieving it and sending it back. Our questions were answered quickly and thoroughly. It was a great stay - beautifully decorated - great supplies in the house - great location! We really enjoyed our stay in AT LAST!!! The staff was accommodating and very friendly. I found them to be extremely patient and helpful. This unit is in a perfect location. Coligny Plaza and South Forest Beach are a short bicycle ride away. The unit is decorated and designed with modern colors and accessories. It is very warm, stylish, and homey. Your family will love it. The team is always great! This was the nicest condo that we have stayed in. It was recently renovated, very well stocked, and very clean and attractive. It is close to the beach and nicely located for getting around Hilton Head. Also within walking distance of Coligny Plaza as well as other venues along Pope Road. Easy driving access to Sea Pines. I will definitely try to stay in this unit again!